DataGravity, the upstart data-aware storage platform founded by serial entrepreneur Paula Long, is turning into a dollar bill black hole, sucking in another fifty million in C-round of funding. The company, profiled here, has a hybrid flash/disk array with substantial metadata facilities to provide significantly more knowledge about the data stored and its originators and readers. For example, unwanted crap data can be located and deleted or archived. The company - around since 2012 and the recipient of $12m in an A-round of funding that year, and $30m in a B-round in 2013 - has now acquired an additional $50m, a total of $92m in almost three years. DataGravity’s first product shipped a few months ago and early reports must have been encouraging enough for the VCs to queue up and pump in more dollars. The cash will be used to help develop the product line and build out its sales and support infrastructure; classic C-round-funded activities. 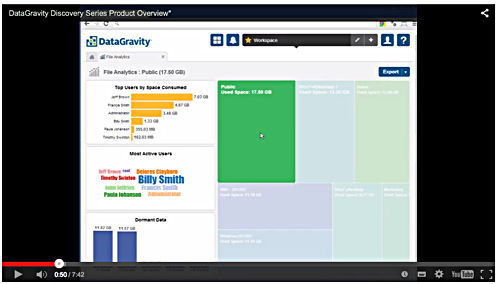 Data Gravity overview. Click image to play video. The company’s product is essentially a better external storage array, and there are plenty of installed ones to displace/replace. It will be interesting to see how it copes with market forces encouraging virtual SANs and cloud storage. Does it, for example, have any relevance to public cloud service providers and can it be delivered as a software product for virtual SANs?